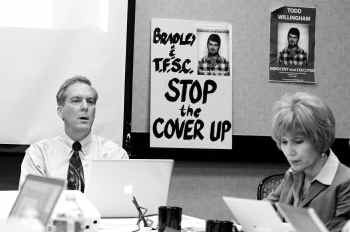 The Texas Forensic Science Commission rebelled Friday against its head commissioner, refusing to accept his draft report clearing arson investigators of misconduct or negligence in a 1991 fatal fire where flawed science was used to determine the blaze was intentionally set. Texas Forensic Science Commission Chairman John Bradley, seated next to counsel Barbara Deane, pushed members to end their investigation by voting that misconduct did not occur in the 1991 arson case of Cameron Todd Willingham. Cameron Todd Willingham was executed in 2004 for killing his three children by setting that blaze. Texas may have executed an innocent man on Gov. Rick Perry’s watch if the fire was accidental. The commission instead plans to question arson experts at a future meeting about investigation standards at the time of the fire and will look into whether the investigators knew or should have known the science that led them to assume the fire was caused by arson was flawed. That puts the commission’s plans right back where they were nearly a year ago, just before Perry suddenly replaced the chairman and two members of the commission. Perry’s October 2009 dismissals came two days before commissioners were to hear from Baltimore-based Craig Beyler, a nationally recognized fire expert hired by the panel. Beyler has called the fire investigation into the Willingham case slipshod, saying the conclusion that the fire was caused by arson was based on wives’ tales about how fire behaves. Perry’s replacements were seen by some as a political maneuver intended to change the outcome of the commission’s decision. Perry replaced Austin defense attorney Sam Bassett with conservative Williamson County District Attorney John Bradley as head of the commission. Perry, however, said the change was a typical use of his power for appointments. When asked to respond to the commission’s Friday decision to reject the draft report and keep reviewing circumstances around the arson ruling, Perry’s office only pointed out that Willingham was convicted by a jury and that decision was upheld by state and federal courts. “We expect that the commission will appropriately complete their review of this case,” the statement said. Had the commission accepted the draft report as Bradley wanted, it would have ended the commission’s inquiry into the Willingham case. Bassett, the replaced chairman, said in a prepared statement that “science prevailed” when the commission rejected the draft. “It is heartening to see the scientists on the commission are taking this investigation seriously and requiring that more be done,” he said. At a meeting set for Nov. 19, the commission is now expected to hear from experts, including Beyler, who concluded that no reasonable investigator could determine that the Corsicana house fire was intentionally set.